When my daughter and I went Gluten-Free in 2005 there were a few things we really missed. 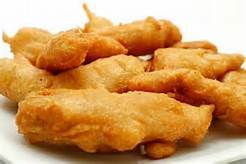 Deep Fried Fish and Chips were probably #1. Chicken Strips and onion rings ran a close 2nd. Finally, I discovered that our All Purpose Flour Blend was the missing link and the result is this super simple batter that is perfect for all of the above. Mix together Flour Blend, tonic water, corn starch and beaten egg. Let batter rest for 15 min. Wow! Made onion rings and fish for dinner using this batter recipe… its been a LONG time (since I am gluten free) that I have had such crispiness! Even after cooling! Amazing! I did add some taco seasoning for flavor, to the batter, but it was the crispy crunch that had me! And the fish was perfectly cooked too! Yum! YAY! So happy for your success. Taco seasoning in the batter sounds delicious. I’m going to try that next. how thick should the batter be? when I combined all ingredients I had mortar! I kept on adding liqud until it looked like it would coat something. Not sure what happened there. The oats do a great job of absorbing liquid – but I’ve never had “mortar”. I’ll make this again and try to figure out what went wrong.